Managers often served more as all-purpose business administrators than in-game strategists in this era.7 Even so, upon his hiring, Fogel’s youth and inexperience “caused a broad grin among baseball men.”8 A lively summer followed. Jack Glasscock was stripped of his captaincy. Fines and suspensions greeted other players. Umpires were accused of “barefaced robbery.” The manager drank.9 But the Hoosiers’ fortunes did not improve. Fogel abruptly resigned in November. The wealthy and powerful Freedman was focused on Tammany politics and Gotham achievements first, the Giants second. After Giants manager George Davis signed with the upstart American League in October 1901, the team drifted through the offseason with no one at the helm. Reports emerged that Freedman had signed Ned Hanlon as skipper.15 But on January 24, 1902, Fogel was instead announced as the twelfth Giants manager since Freedman took control of the franchise in 1895. Giants baseball was a dismal brand, a baseball war was underway, and the 1902 season was looming. But Fogel threw himself into recruiting with bravado. He announced plans to steal Nap Lajoie from the Athletics, and threatened American League President Ban Johnson with a “war of reprisal” once Giants pitcher Dummy Taylor jumped to Cleveland.16 “This is frightful,” a Philadelphia scribe smiled, “but then Fogel always was a regular terror when he got started.”17 Despite the sound and fury, the new skipper added only untested collegians and cast-offs to the remnants of 1901’s last-place squad. The pitcher and manager publicly argued, the pitcher asking for his release. Doyle and the rest of the team closed ranks around Mathewson. The team continued to lose. Fogel re-assigned the captaincy to second baseman Heinie Smith. On June 11, with the team at 18-23, Freedman appointed Smith as the new manager. Fogel remained on staff as a scout. Years later, Mathewson helped to create the lasting perception that Fogel had attempted to convert him to a first baseman.19 Yet Matty’s three games at first that season occurred during Smith’s managerial stint.20 William Koelsch, writing in Sporting Life, noted, “While the team was in Philadelphia, Road Agent Fogel put in [an] appearance and announced that hereafter Christy Mathewson must play in every game, and after talking over matters with Smith the big twirler was placed at first base.”21 Another New York scribe, Joe Vila, later claimed, “It was the genial Freedman who originated this brilliant idea and told Fogel to carry it out.”22 Vila’s take seems more plausible. Smith had no reason to listen to—and Matty may have rebelled against—unauthorized, unsolicited advice. Soon it was reported that Fogel was recruiting for not just the Giants, but the entire National League. Two NL teams quickly rebuffed his services, while AL stars had “lots of fun jollying the chief scout.”23 Fogel, a Cincinnati scribe opined, had become “the baseballic joke of the year.”24 Finally, he settled his back pay with Freedman, returned to Philadelphia, and a role as the Evening Telegraph’s sporting editor. Fogel shared a North Philadelphia home with his wife, Alice, and their only child, Harry. After completing his education, Harry also pursued a sportswriting career, working alongside his father at the Evening Telegraph. Philadelphia’s sportswriters were closely knit and, whatever battles Horace waged with the rest of the baseball world, he enjoyed warm relations with his local peers. Each offseason, the scribes held lavish dinners. Each Decoration Day, they placed wreaths on their late colleagues’ graves. In 1904, only 21 years old, Harry passed away, becoming a stop along this solemn procession. Fogel usually treated the Athletics with kid gloves. He admired the “shrewd, wide-awake” Connie Mack, who in turn ably handled the city’s often difficult sportswriters.31 But if any disruption appeared in Mack’s stable, successful team, Fogel ran with the story. Or helped manufacture one. Fogel’s 1903 team of potential buyers had included State Senator Israel Durham and real estate wunderkind Felix Isman. In early 1909, Durham led another group of Philadelphians to purchase the Phillies from the Potter syndicate.37 Durham died on May 28. Weeks later, Isman bought an option on the late Durham’s stock, but lit a firestorm attempting to replace manager Murray with Mike Donlin, and backed away.38 Fogel remained on the sidelines through the chaos. Meanwhile, Fogel’s old friend Brush (who had purchased the Giants from Freedman in 1903) and Cubs owner Charles Murphy sought to overthrow NL President John Heydler. In the league’s annual year-end meeting, Brush and Murphy believed Brooklyn’s Charlie Ebbets and St. Louis’s Stanley Robison would join them in supporting John Montgomery Ward to replace Heydler.39 But where could they find the deciding fifth vote? With peace at hand, the magnates ignored the Phillies’ suspected syndicate ownership as so much insignificant corruption, and Fogel turned towards the upcoming 1910 season. He summarily dismissed manager Murray, replacing him with catcher Red Dooin. After Taft purchased the National League Park, Fogel launched plans for more bleacher seats. The players were assigned new, green-trimmed uniforms. A Hippodrome company—essentially a three-ring circus—performed nightly at the park during the summer. “Horace yearns for publicity like an actress lady,” one of his critics observed, “and is generally sliding into print, feet first.”46 In particular, Fogel could rarely resist the temptation to publicly meddle with his manager. After the 1910 season, Dooin put together a deal with his Reds counterpart, Clark Griffith. Philadelphia would send Johnny Bates, Eddie Grant, George McQuillan and Lew Moren to Cincinnati for Fred Beebe, Hans Lobert, Dode Paskert, and Jack Rowen. With the trade apparently sealed, Herrmann began signing the new Reds to contracts. Fogel took to the press, disputing the trade’s legitimacy and arguing that it would “interfere with deals he had in contemplation of which Manager Dooin knew nothing.”47 But Fogel provided no evidence of any serious alternate deals, the actual Dooin-Griffith agreement was widely considered advantageous to Philadelphia, and Herrmann held his ground. Fogel retreated. Lynch suspended Magee for the remainder of the season. Fogel took the case to the NL’s Board of Directors.50 The Board met on August 1 and voted to leave the matter with Lynch, who threatened Fogel with a libel suit based on letters the Phillies’ leader had previously sent him.51 Lynch reinstated Magee several weeks later but, by then, key injuries had overcome the team. Although attendance increased to 416,000, Philadelphia again finished in a distant fourth place with a 79-73 record. Hopes were high as the 1912 season launched, with a “universal belief that the Phillies would be the one team the Giants would have to reckon with” in the pennant chase.52 But Philadelphia almost immediately fell out of contention. Attendance plummeted. Fogel berated his players in print. Mostly he took out his frustrations on the umpires and Lynch, this time with fatal consequences. This proved the breaking point. Stating that “my chances of being re-elected president are better by having Fogel against me,” Lynch immediately prepared charges, to be considered by the league as a whole.57 With the sport’s integrity at stake, the other magnates stifled whatever animosity they had towards Lynch, and fell into line behind him. The fiction that Fogel owned the Phillies evaporated. Taft announced he was “tired of the ill-success of the club this year and the trouble Mr. Fogel has brought upon himself and the club by his incessant war upon President Lynch.”58 Sportswriters detailed how Taft had lent Fogel the money to buy the team in 1909, “taking [promissory] notes on the franchise as collateral.”59 Fogel, with foresight, had obtained from Taft “first chance at the club in case it was ever sold again.”60 With his head in the noose, he scrambled to put together a team of buyers. He was unsuccessful, and agreed to pay Taft an additional $15,000 to extend his option.61 Meanwhile, as his showdown with Lynch loomed, Fogel futilely sought to buy time, and issued defiant statements that he would prevail. In March 1913, determined to attack the “baseball trust,” Fogel launched Baseball Weekly.71 The magazine petered out quickly. Soon afterward, Congressman Thomas Gallagher planned an investigation into Organized Baseball. Fogel eagerly hoped to testify. But the magnates helped to steer the effort into a bureaucratic death.72 That fall, as Federal League owners met to challenge the established major leagues, Fogel offered a scheme to plant a franchise in New York. But he was “openly ridiculed” and asked to leave.73 From that point forward, Fogel left behind his baseball ambitions. He free-lanced a few sports columns, worked in the silk business, and toiled at an auto accessories store. In September 1920, as Black Sox confessions shattered baseball’s reputation, Fogel returned with tales of earlier corruption. In 1905, he maintained, Waddell had indeed been reached by gamblers, accepting an initial payment before confessing. In the famed 1908 NL pennant race, Fogel stated, several Phillies turned down bribes to throw a key series against the Giants. Organized Baseball, he suggested, had quickly buried both incidents.74 Dooin confirmed the 1908 incident.75 But no evidence ever appeared to support Fogel’s claims on Waddell being corrupted in 1905. 1 Michael Lalli, “Horace Fogel: The Strangest Owner in Phillies History,” Philly Sports History, http://phillysportshistory.com/2011/07/06/horace-fogel-the-strangest-owner-in-phillies-history/, accessed August 15, 2016. 2 Within recent years, baseball historians have provided valuable interpretations of Fogel not always in agreement with the conclusions reached in this piece. See Steven A. King, “The Strangest Month in the Strange Career of Rube Waddell,” The National Pastime: From Swampoodle to South Philly (Phoenix: SABR, 2013); Steve Steinberg, “The Man Who Knew (and Talked) Too Much,” Base Ball: A Journal of the Early Game, Vol. 6, No. 2 (Jefferson, NC: McFarland, 2012). 3 Jack Ryder, “Big Deal Down for To-Day,” Cincinnati Enquirer, November 26, 1912, 6. 4 “Promoted,” Allentown Democrat, August 25, 1880, 3; “Macungie Honors Its Native Son Horace S. Fogel,” Allentown Democrat, February 10, 1910, 1. 5 “The Two F.S Joined,” Sporting Life, February 1, 1902, 3; “Manager Horace Fogel,” Boston Herald, February 16, 1902, 40. 6 “A New Manager,” Indianapolis News, July 5, 1887, 1. 7 Chris Jaffe, Evaluating Baseball Managers: A History and Analysis of Performance in the Major Leagues, 1876-2008 (Jefferson, NC: McFarland, 2010), 65-66. 8 “Indianapolis’ New Manager,” Cincinnati Enquirer, July 6, 1887, 2. 9 “Chips From the Diamond,” (New York) Sun, July 25, 1887, 3; “Notes,” Cincinnati Enquirer, August 12, 1887, 2; “Sports of the Season,” (Washington, DC) Daily Critic, August 30, 1887, 4. Reports of Fogel’s drinking came from one of his players, Otto Schomberg, in a letter published in Indianapolis News, August 21, 1888, 4. 10 “Philadelphia Pointers,” Sporting Life, February 27, 1892, 3; “Some Pie,” Harrisburg Telegraph, December 16, 1893, 2; “News, Gossip and General Comment,” Sporting Life, October 20, 1894, 4. 11 “The State League Meets,” (Harrisburg) Patriot, May 18, 1894, 1; “Barrows Elected President,” Pittsburgh Post-Gazette, November 24, 1896, 4; “Base Hits,” Wilkes-Barre Record, October 27, 1898, 3. 12 On the NBL: “Basketball Galore,” Philadelphia Inquirer, October 17, 1898, 4; “News From the Basketball World,” Trenton Evening Times, January 9, 1901, 2. On the AL: “The Atlantic League,” Sporting Life, September 23, 1899, 4; “Athletic News,” Harrisburg Telegraph, June 9, 1900, 5. 13 For background on these ‘trust’ efforts, and the New York magnate, see Bill Lamb, “Andrew Freedman,” SABR Baseball Biography Project, http://sabr.org/bioproj/person/51545e58, accessed June 26, 2016. 14 “Freedman Gets Fogel,” Boston Herald, January 25, 1902, 4; “Boston Base Ball Topics,” Philadelphia Inquirer, February 9, 1902, 13. 15 Wm. F. H. Koelsch, “New York Nuggets,” Sporting Life, February 1, 1902, 5. 16 Ernest Lanigan, “After Athletics,” The Sporting News, April 12, 1902, 4; “A War of Reprisal,” Boston Herald, March 18, 1902, 8. 17 “Comment,” The (Philadelphia) Times, March 16, 1902, 8. 18 For Fogel’s quotes to the Cincinnati reporter, see “Baseball Gossip,” Washington Times, May 21, 1902, 21. For an overview of the controversy, see Chuck Kimberly, The Days of Wee Willie, Old Cy and Baseball War: Scenes from the Dawn of the Deadball Era, 1900–1903 (Jefferson, NC: McFarland & Company, 2014), 138-141. 20 Mathewson started at first in three consecutive games: June 28 at Philadelphia, and June 30 and July 1 versus Boston. The pitcher also played four games in the outfield for the Giants in 1902, but again not during Fogel’s stint. He relieved Jim Jones in left field on July 14 at Cincinnati, then started three games under John McGraw (who took over for Smith in mid-July): August 16 at Chicago, August 30 at Philadelphia, and October 3 at Boston. 21 Wm. F. H. Koelsch, “New York Nuggets,” Sporting Life, July 5, 1902, 3. 22 Joe Vila, “As Lightning Bolt,” The Sporting News, December 2, 1909, 1. 24 Fred J. Hewitt, “With Fourteen Scalps A-Dangling,” Cincinnati Post, August 15, 1902, 2. 25 For examples of Fogel heavily featured in a Veteran column, see “Misled,” The Sporting News, December 26, 1903, 3; “Show Better Form,” The Sporting News, August 13, 1904, 1; “Big Lead Reduced,” The Sporting News, September 30, 1905, 1. During his unsuccessful congressional race in 1906, Fogel acknowledged that he was Veteran. See “Plucky White Sox,” The Sporting News, October 20, 1906, 4. 26 Horace Fogel, “Strenuous Season,” The Sporting News, October 31, 1907, 3. 27 I. E. Sanborn, “Cause of Trouble,” The Sporting News, November 7, 1907, 1. 28 Horace Fogel, “May Get M’Gann,” The Sporting News, November 14, 1907, 5. 29 Horace Fogel, “Can’t Get Over It,” The Sporting News, October 28, 1909, 1. 30 Horace Fogel, “Rich and Liberal,” The Sporting News, March 11, 1909, 1. 31 Veteran [Horace Fogel], “Pulling for Both,” The Sporting News, May 21, 1904, 1. On Mack’s relations with the press, see Norman Macht, Connie Mack and the Early Years of Baseball (Lincoln: University of Nebraska, 2007), 568-571. 32 Veteran [Horace Fogel], “Great Advantage,” The Sporting News, September 2, 1905, 1. 33 Veteran [Horace Fogel], “Big Lead Reduced,” The Sporting News, September 30, 1905, 1. Fogel, as he was wont to do, also came back to the affair years later, suggesting he had told only a fraction of the true story. See Horace Fogel, “Bribers at Work,” The Sporting News, December 17, 1908, 5. 34 For one of many of Fogel’s columns on the 1903 sale, see Veteran [Horace Fogel], “Misled Herrmann,” The Sporting News, December 26, 1903, 3. For a counterpoint to Fogel’s interpretation, see A.R. Cratty, “In Pittsburg,” Sporting Life, December 4, 1909, 9. 35 Veteran [Horace Fogel], “Barney’s Blunder,” The Sporting News, July 9, 1904, 5; Veteran [Horace Fogel], “Phillies’ Future,” The Sporting News, November 5, 1904, 1. 36 Horace Fogel, “At Pennant Pace,” The Sporting News, July 9, 1908, 5. 37 “Senator Durham Buys the Phillies,” Philadelphia Inquirer, February 25, 1909, 10. 38 “Mike Donlin Secured to Manage Phillies,” Philadelphia Inquirer, July 25, 1909, 9; “Donlin Succeeds Billy Murray,” Cincinnati Enquirer, July 25, 1909, 11; “All Sports,” Cincinnati Enquirer, August 1, 1909, 38; The Sporting News, July 29, 1909, 4; “Deal for Donlin is Declared Off,” (Washington DC) Evening Star, August 3, 1909, 11. 39 “Sale of the Phillies Gains Ward Vote,” Chicago Tribune, November 27, 1909, 14; Jack Ryder, “Syndicate Ball in National League,” Cincinnati Enquirer, November 27, 1909, 8. 40 “Phillies Pass into the Hands of New Owners,” Philadelphia Inquirer, November 27, 1909, 1. 41 Jack Ryder, “Look Out, They’re at the Post,” Cincinnati Enquirer, December 16, 1909, 8. 42 Francis C. Richter, “Peace and Harmony,” Sporting Life, December 25, 1909, 1, 6. 43 “Lynch’s Labor,” Sporting Life, August 6, 1910, 6. 44 “Fogel is Having His Own Troubles,” Brooklyn Daily Eagle, August 19, 1910, 16. 45 “Umpires Blamed by Horace Fogel,” Harrisburg Telegraph, December 13, 1910, 12. 46 Thomas S. Rice, “Sports Comment,” Brooklyn Daily Eagle, December 2, 1911, 17. 47 Francis C. Richter, “A Big Philly Row,” Sporting Life, November 5, 1910, 4. 48 “Dooinites Claim Both Games Today,” Pittsburgh Press, July 18, 1911, 16; A. R. Cratty, “Pirate Points,” Sporting Life, August 19, 1911, 24. 49 The Sporting News, July 20, 1911, 4. 50 “Fogel Demands That Board of Directors Take Action on Case,” Philadelphia Inquirer, July 22, 1911, 8. 51 “The Magee Case,” Sporting Life, August 12, 1911, 2. 52 “Senior League,” Sporting Life, November 2, 1912, 10. 54 “Fogel Joins Murphy; Wars on Bresnahan,” Chicago Examiner, August 19, 1912, 8. 55 “Horace Fogel No Longer President of the Phillies,” New York Tribune, November 27, 1912, 10. 56 “Umpires Told to Win Pennant for Giants,” Chicago Examiner, September 29, 1912, 1. 57 “Directors of National League Will Investigate Charges Made by Fogel,” Cleveland Leader, October 1, 1912, 9. 58 “Philadelphia Points,” Sporting Life, November 2, 1912, 7. 60 William G. Weart, “It’s Fogel’s Chance,” The Sporting News, October 24, 1912, 1. 61 “Fogel Admits He’s But a Figurehead,” Pittsburgh Press, November 22, 1912, 30. 62 Jack Ryder, “Wee Hours Held ‘Em Together,” Cincinnati Enquirer, November 27, 1912, 6. 63 Jack Ryder, “Integrity of Baseball Upheld,” Cincinnati Enquirer, November 28, 1912, 6. 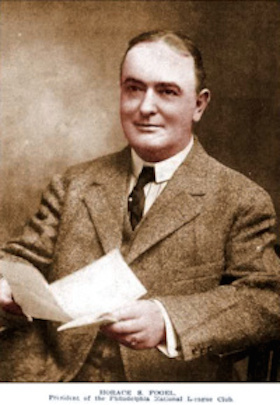 Albert Wiler was presented as the Phillies’ president on the first day. The trial continued, with this seen as a ruse. At the end of the proceedings, Wiler abstained from voting, but strongly endorsed the case against Fogel. 64 “Fogel Quits As Quaker President; New Head Named,” St. Louis Post-Dispatch, November 26, 1912, 18. 67 The Sporting News, December 5, 1912, 4. 68 Jack Ryder, “Fall of Fogel,” Sporting Life, December 14, 1912, 14. 69 “Horace Forgot to Pay for His Option,” Pittsburgh Press, December 10, 1912, 22. 70 “Taft Decides to Keep Phillies,” (Washington, DC) Evening Star, December 20, 1912, 18. 71 “Fogel Still Harps on Baseball Trust,” Boston Journal, March 27, 1913, 8. 72 Stuart Banner, The Baseball Trust: A History of Baseball's Antitrust Exemption (New York, NY: Oxford University Press, 2013), 44-46; “William Peet, “The Baseball Trust is Doomed, Says Fogel,” Washington Herald, June 6, 1913, 8. 73 “Is Jeff Livingston the Man?” Sporting Life, November 22, 1913, 3. 74 “Gamblers Tried to Buy Local Players,” Philadelphia Inquirer, September 30, 1920, 5. 75 “Phils Offered Bribes in 1908, Says Red Dooin,” Chicago Daily Tribune, October 1, 1920, 19. 76 S. O. Grauley, “Horace S. Fogel, Famous Sport Critic and Baseball Manager, Dies At Home,” Philadelphia Inquirer, November 16, 1928, 18.